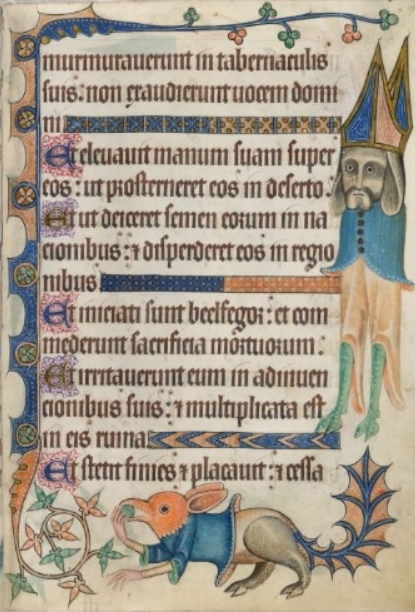 This image is from the Luttrell Psalter, which was made in England c. 1320-1340. You should consider the monstrous figures in relation to one another and to the text on the full page of the manuscript. suis; non exaudierunt uocem Domini. they hearkened not to the voice of the Lord. eos ut prosterneret eos in deserto. tionibus, et dispergeret eos in regionibus. the nations, and to scatter them in the countries. ate the sacrifices of the dead. Et stetit finies, et placauit, et cessa-[vit quassatio].